Here is a little gift I whipped up for someone, hehe. my blog, so I hope I am not ruining a surprise too much by posting this..! I made this using the same method in this tutorial, but instead of 2 1/2" squares, I used 1 3/4" x 2 3/4" rectangles, which makesa 7 1/2" x 7 1/2" drawstring pouch. I also sewed the patchworkpanel onto thin muslin to stabilize it. If you are anything like me, you had a longest list of to-make-forChristmas gifts to begin with, but now you are finally realizing that 1) Christmas is just in 10 days,2) you don't have time to cross off everything on the list,and 3) you need a Plan B - switching your initial ideas to something a lot quicker and simpler. At least for me, this happens every year, haha. Oh and you must have seen Kerry's amazing newest paper pieced Candy Cane pattern by now. It's on sale in her shop, but if you wouldlike to win the pattern, leave one comment on this post by Thursday midnight.A random winner will be announced here this Friday. Thanks for the giveaway, also for the list of quick gift ideas! Oh that Candy Cane Love pattern is too cute! Adore the Candy Cane pattern too! Side note - I made your wristlet for my daughter and she gets so many compliments on it. Thanks for all your wonderful tutorials! What a sweet pink bag from Pink Penguin!! You know, last weekend I attended a craft fair and there was a young Japanese sewist there with all her lovely sewn pouches, key fobs, iPad sleeves. All made with Echino and Yuwa. Of course she reads your blog and IDOLIZES you Ayumi! Yes, you! She was adorable and very surprised that I 'knew' you, too. That was fun. 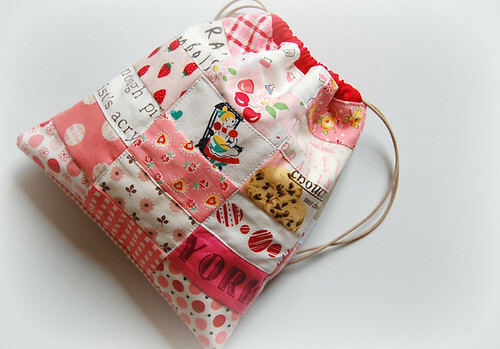 What an adorable little bag Ayumi! !, yr fabric choices are perfect! love your candy canes -- they are just too dawgone cute! please count me in the draw, and thank you for this grand opportunity! yay! This is such a cute bag Ayumi!! I'm in the same spot as you are, there isn't enough time eeek! With all the sewing I have done I've only made one proper Christmas present and that's it. Time for a back up plan indeed. Wish I had some jewellery on my list so I could shop at your sisters shop. That is the cutest little bag! I think I am on about Plan E already - where does the time go!? What a great idea for a quick project, thanks for sharing the links too! My plans are all over the place- I forget how little I can get done in last week of work. That is such a cute girly bag! Love those fabrics you have used. Thanks for all the links Ayumi and have a great Christmas. what a sweet little bag! I have already made some of the things on your list, but definitely it's time to keep it simple! I'm secretly making one of your lunchbag/bento box for a friend - but I know she will guess it is for her if I put it on my blog....so I'll leave it 'till after Christmas. Thanks for the links you have attached to this post. A treat to the eyes and a present for my imagination. Have a fabulous Christmas break. Thanks a lot for all those great links! yes, I'm frantically sewing the binding on a quilt for friends and wondering how I'm going to wrap up my other handmade gifts! 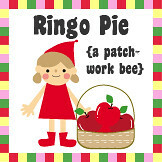 I'm hoping to give paper piecing a try in the new year (scary!) 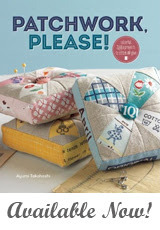 so would love to win a copy of Kerry's pattern! Such a cute bag Ayumi. I know whomever receives it will love it. Good luck with all of your holiday sewing. I have some to still finish too and can't believe we are 10 days away! I bet get going!! Thanks for the chance to win the Kerry's paper piecing pattern- I love those candy canes. I do love that pattern so it would be fun to win! Such a cute bag! Love the fabrics and I like that it's rectangles rather than squares - good idea! Gorgeous bag! I'm not doing any Christmas sewing this year, I did loads last year and decided I deserved a year off!! oh it is so cute! thanks for the list of quick makes...my handmade christmas is quickly turning into a giftcard christmas! This is so cute, I find it so hard to match pink fabrics for some reason but yours look like they were made for each other. And your seams are perfect! Thanks got the list of great tutorials! Your little bag is a perfect size. Thanks for the chance to win this giveaway. I'm going to give your patchwork kinchaku a try soon. 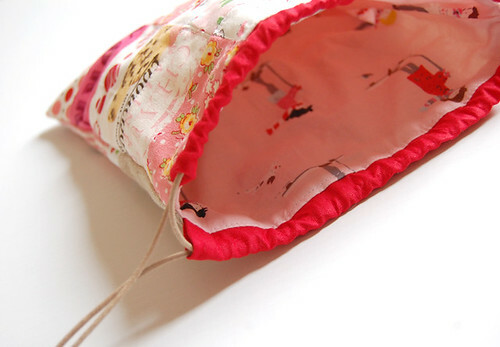 What a great way to use up scraps! 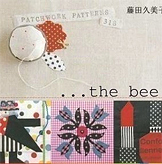 I've also resolved to learn paper piecing next year and Kerry's pattern looks like a good one to start with. Thanks for the chance to win! 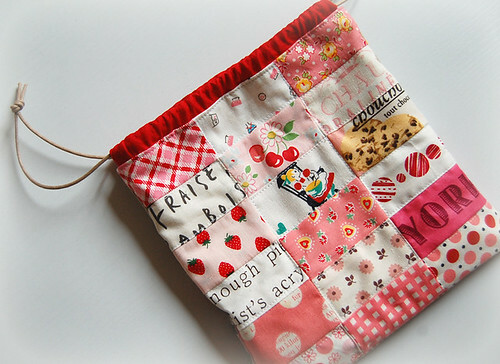 Love your little bag and the fact that it is reversible is fantastic. Thanks for the chance to win! Keep at it...you are making great progress. Sweet, Ayumi! I am currently shaking in my boots because a Christmas present that MUST be is still waiting a fabric shipment. Please come soon! this is so darned pretty, Ayumi! Thank you for the inspiration! I've been making Christmas gift bags based on your tutorial, but have been falling behind. Thanks for getting me excited about bags again! I am so in love with that secret gift bag, so colourful and fresh it will be a lovely present. This is so adorable Ayumi. The owner will be thrilled !!! I got to see this bag in person a few minutes ago - the recipient is a friend and lives just up the street :) IT IS GORGEOUS! It's so pretty - the fabrics are just delicious, and the back is just as pretty as the front - I can't believe my friend has an original Ayumi, and I got to fondle it!!! Ayumi you are a doll! this bag is so fantastic, Ayumi. i love how you mix fabrics together. Thanks for the tutorial. Will try to make this for my wife birthday gifts.